I really love this stamp set so don’t understand why I’ve not used it more. The details in the flower and leaf is so clear and yet intricate. Love. Love. Love. Just as my own personal ‘celebration’ of SU’s announcing that both Pool Party and Island Indigo are joining the ranks of the permanent colour families I designed this card to compliment the Summer Solstice stamp set. And yes! There’s even a butterfly! What a surprise coming from Moi. This is one of the cards that my Tenterfield and Stanthorpe classes will be doing this month. So if you live in the area and want to create five beautiful cards and have a day of creative fun and quite a few laughs, contact me for venue details. 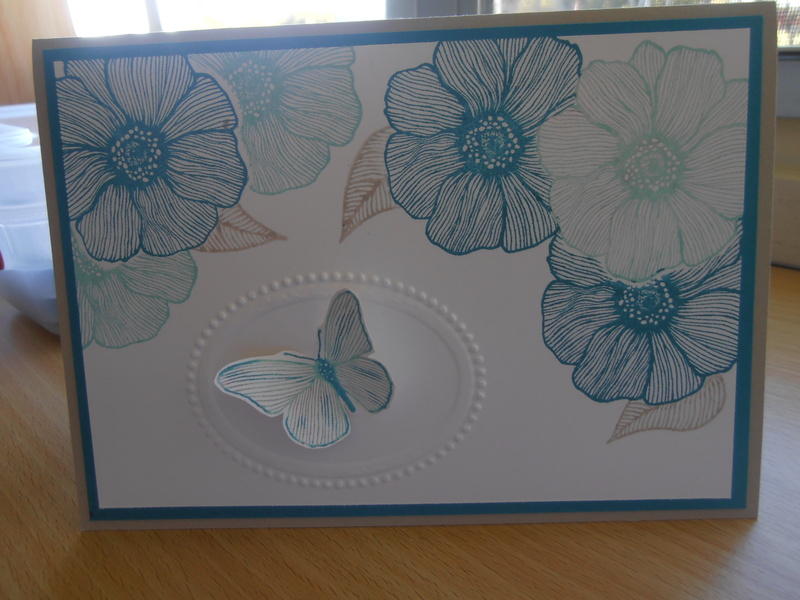 Another fabulous day of creating beautiful cards with beautiful Jacqui….. I always look forward to it and am never disappointed with the end results. Can’t wait until the next time!! Thanks so much Kathy. Love my classes in Tenterfield the girls that come to those classes are always so bright, cheery and appreciative. I love what I do and love sharing what I love.